Megan attended the Paul Mitchell academy in Tyson’s corner VA, and started her career right here at S-kape! She also trained in our associate program under Tami, Karyn, and April. Her knowledge of professional products from lighteners, treatments, and home maintenance care is like nothing we have ever seen- a true walking encyclopedia! 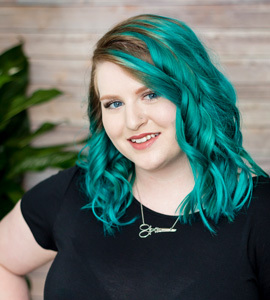 Megan has a true passion for doing hair and delivering superior results in every head she touches “I am so excited to be doing hair, it’s my passion. Please let me work my magic on you.” When Megan is not performing her magic, she is with her family, nothing means more to her than anything. Megan serves guests on Tuesdays 3-9, Wednesdays 3-9, Thursdays 3-9, Fridays 7:30-1:30, most Saturdays 7:30-3:30 and every other Sunday 9-3.